When capturing screenshot with Grabilla, you can define default actions that will be taken to screenshot after capture. 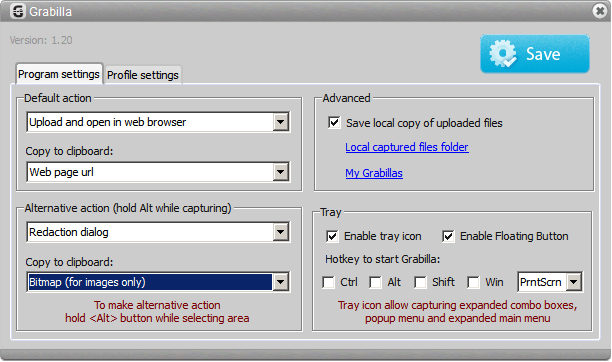 By default Grabilla upload screenshots and files to its server and opens screenshot in default web browser. Link to capture webpage is also copied to your clipboard, so you can use Paste command just after capturing. But sometimes you need to make an alternative action with captured image, like save it locally, or copy to clipboard or something else. You can configure alternative actions for screenshot capture. Then you can launch alternative screenshot action by holding Alt button while capturing screen. Launch Grabilla, press Alt button, select area to capture. In this configuration example, if you take screenshot with pressed Alt button, Redaction dialog will be opened after capturing and then image will be copied into clipboard. Then you can paste it into any graphic software like GIMP or Photoshop, or into office software like Word or Excel. What’s up to every one, the contents present at this web page are actually awesome for people experience, well, keep up the good work fellows.